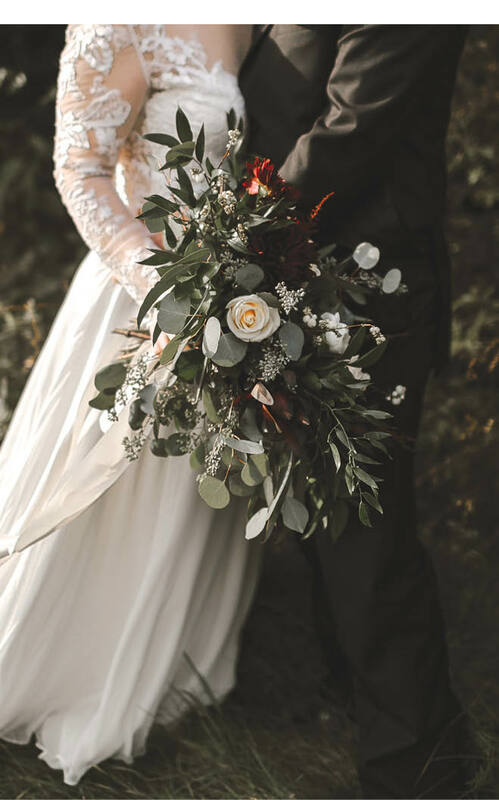 In the land of 10,000 lakes, it’s no wonder that the area bordering its most majestic body of water proves a, well, superior choice for where to wed. Panoramic beauty, built-in entertainment and activities, and historic charm make the North Shore a popular destination for Minnesota brides. Jessica Deziel and David Budzil agree that the North Shore checked all the boxes on their list, for its spectacular natural beauty and as a beloved vacation site. Experiences like that draw many couples back, but those who tie the knot up north overwhelmingly want to take advantage of the area’s stunning scenery. 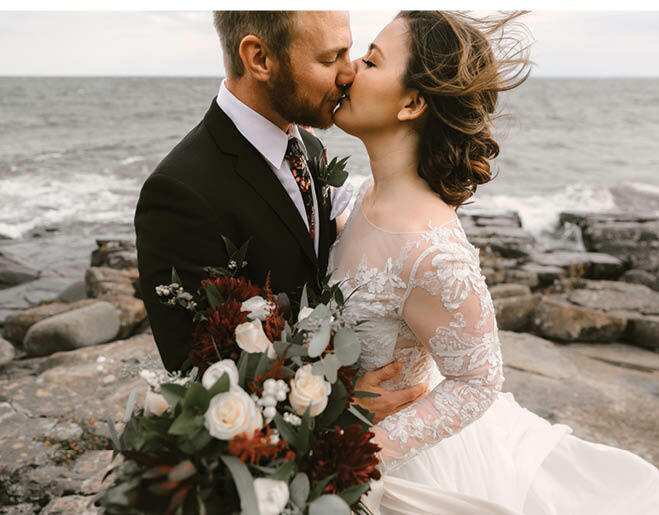 “Spectacular photography is what everyone who chooses to get married up here appreciates: unmistakable sweeping vistas of Lake Superior, the iconic Lift Bridge in the background and beautiful fall colors,” McKechnie says. 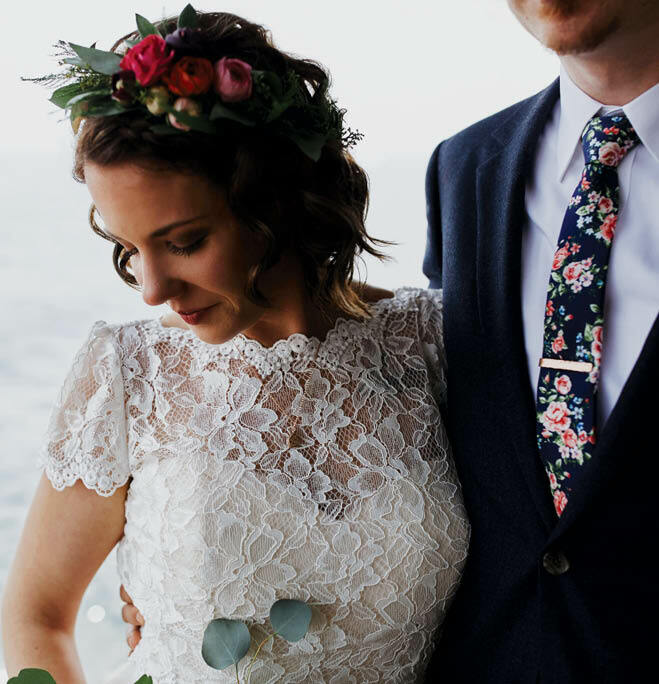 Jes Hayes, owner of Mad Chicken Studio, incorporates images of Lake Superior into nearly all her weddings. “North Shore weddings are always about the lake. That’s the biggest draw for our area. The shorelines are just beautiful,” she says. Amazing photography topped the list of wedding priorities for Deziel and Budzil, who spent the first hours after their ceremony hiking the park’s best rockscapes and waterfalls with their photographer. 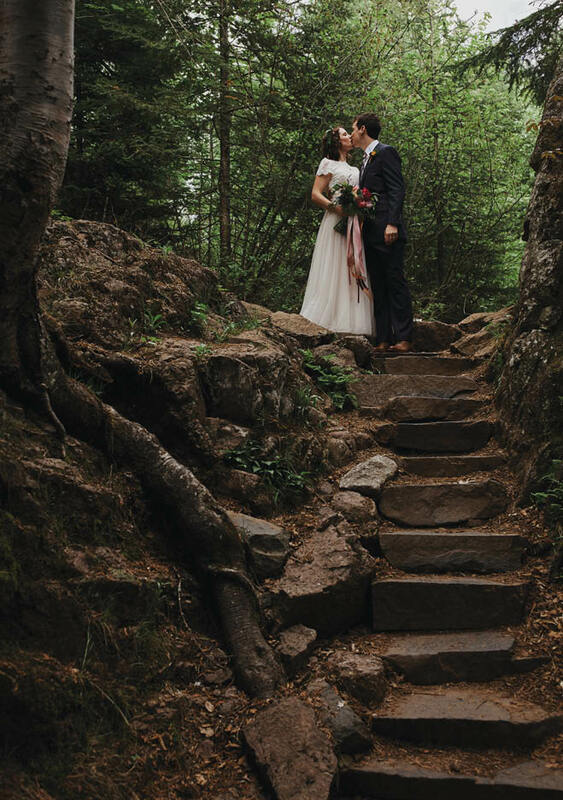 Cedar Cliff Retreat, the Lake Superior cabin that they rented to share with their family, doubled as their reception venue, and its accessible shoreline afforded a magical first-look opportunity. 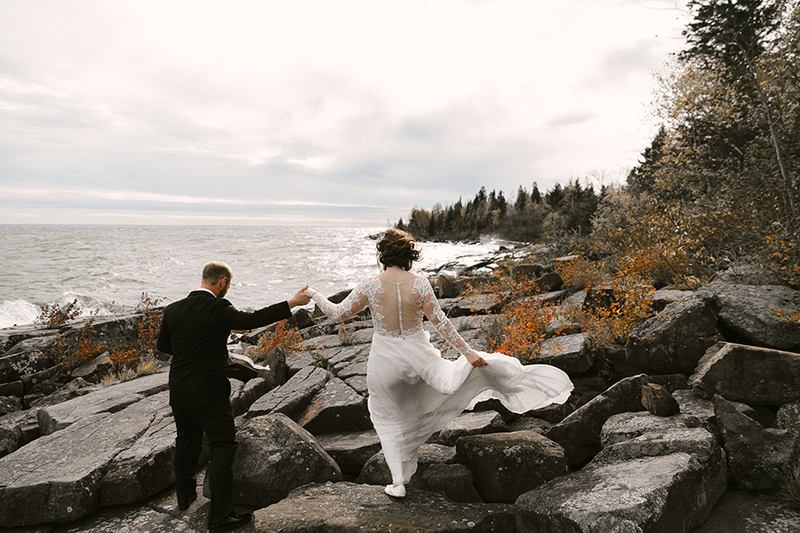 Gain access to the superb shoreline by saying “I do” at Lutsen Resort, Superior Shores Resort or Grand Superior Lodge, to name a few choices in the area. Hayes’ favorite public option is Tofte Park, which has 1,000 feet of rocky shoreline tucked away from the zoom of Highway 61. Check out local photographers Bailey Aro, Kirsten Barbara and Jane Cane Photography to capture similarly stunning scenes. Duluth’s rich history is another draw for couples, says McKechnie. 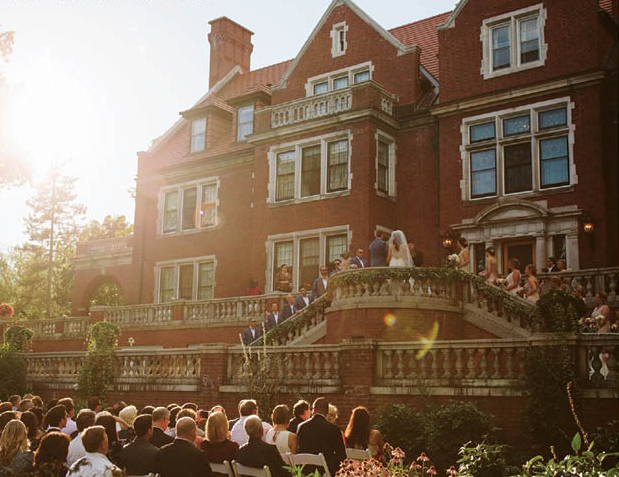 Venues such as Greysolon Ballroom’s Moorish Room, with hand-painted murals, opulent architecture and dramatic lighting, and Glensheen Mansion’s sprawling grounds offer manmade splendor alongside the majesty of the great outdoors. The views will stop you in your tracks, but the North Shore is no idle beauty. “The couples that choose the northern venues are nature lovers so their guests follow suit and just enjoy being there,” McKechnie says. Guests at the weddings she plans mostly opt for outdoor activities during the wedding weekend, such as fishing, kayaking, golfing, hiking and sightseeing. Evening time brings the opportunity to light a bonfire and have s’mores for your guests. For their wedding weekend, many of Deziel and Budzil’s friends enjoyed the couple’s suggestions for hikes and canoeing. The couple headed to Grand Marais with family the day after their nuptials to explore the boutiques and local eateries. Gooseberry Falls and Split Rock Lighthouse also rank high for wedding weekend itineraries. Vista Fleet boat tours offer guests a more relaxed option for Lake Superior sightseeing, and a great choice for a scenic rehearsal dinner venue. All that activity can really work up a thirst. Especially for the rehearsal dinner, many couples include a craft brewing element, part of the North Shore culture, McKechnie says. Deziel and Budzil tapped a keg of Grand Marais’ Voyageur Brewing Co. beer for their guests to enjoy. Hoops Brewing at Canal Park is lovely inside, with huge farm tables and wrought-iron chandeliers, making it a great backdrop for photos, Hayes says. Also worth checking out: Bent Paddle Brewing Co.’s new taproom, and the venerable Fitger’s Brewhouse. Craft-spirits lovers will appreciate the chance to sip Vikre Distillery’s handmade gin and aquavit. Or head north to Castle Danger Brewery in Two Harbors. While the region brims with rustic charm, the wedding vendors are nothing if not sophisticated. McKechnie has seen firsthand that couples can find everything they need locally, with professionals who can execute every unique vision. Many venues offer exclusive catering service, but if given a choice, check out Midcoast Catering Co., whose creative food truck fare spawned a catering business, or consider Duluth Grill, also known for its vegetarian and vegan food. Experts underscore its exceptional value and service. Brides seeking more than the standard wedding cake have some sweet options. To celebrate the local fare, Deziel picked up a variety of Rustic Inn Café’s legendary pies, including the obligatory gooseberry filling. Also in Two Harbors is Highway 61 stalwart, Betty’s Pies. For picture-perfect, modern desserts, SnazzyCakes’ Lyndsay Smitke bakes the most elegant wedding cakes—and does it all herself. So pretty that you may have second thoughts about cutting them, the custom cakes from Lake Superior Bakehouse are as tasty as they are lovely. Picture-perfect flowers are just a call away in Duluth. Bella Flora specializes in super-fresh designs, with a lush garden style and a focus on seasonal blossoms. Saffron & Grey realized Deziel’s dreams for a loose bouquet of rich, jewel-toned blooms, repeated in an 18-foot garland adorning the fireplace in her cabin. McKechnie’s Fleurtation lives up to her top-notch reputation with excellent execution of customized designs. Then there’s Duluth Flower Farm, whose peonies, dahlias and other florals are always fresh-plucked from the garden. Looking to get pampered on your big day? Head to Fitger’s Salon & Spa for an elegant environment with experienced stylists. Put your best face forward with expert Derick Cich Makeup Artistry, who has worked such events as New York Fashion Week. For the perfect ’do, check out Language of Hair, an Aveda Concept Salon that’s super-savvy about trend-forward and classic wedding-day looks. A dream-worthy wedding starts with a fabulous venue. Check out these North Shore sites, for starters. With several options for lakeside lodging among its family of resorts, Bluefin Bay in Tofte will wow your guests. Exchange your vows on a breathtaking rockscape as waves lap the shore in the resort’s intimate private cove, then dance the night away with up to 90 guests in the ballroom. Mountain-view ceremony? Yes, please. Weddings of all seasons find a fantastic home at Caribou Highlands in Tofte. It’s nestled in the Sawtooth Mountains, which means you’ll have gorgeous vistas at every turn, including from their Mountain View Ballroom, which can accommodate 100 guests. Family and friends all in one place for the weekend; rehearsal dinner, welcome party and morning-after brunch all on-site; plenty of opportunities for hiking, bonfires, lawn games: A perfect destination wedding awaits at Grand Superior Lodge in Two Harbors. The ceremony location has breathtaking views of Lake Superior, which means you have endless opportunities for totally dreamy photos, too. Celebrate the rich history and grandeur of the North Shore in Minnesota’s most-visited house, Glensheen Mansion. Say “I do” on the three-tiered terrace overlooking stunning gardens and Lake Superior, then cross the creek bridge on your way to the pebble beach and pier for dazzling photos. Accommodates smaller groups to 300-person tented affairs. Take your wedding guests back to a more glamorous time. 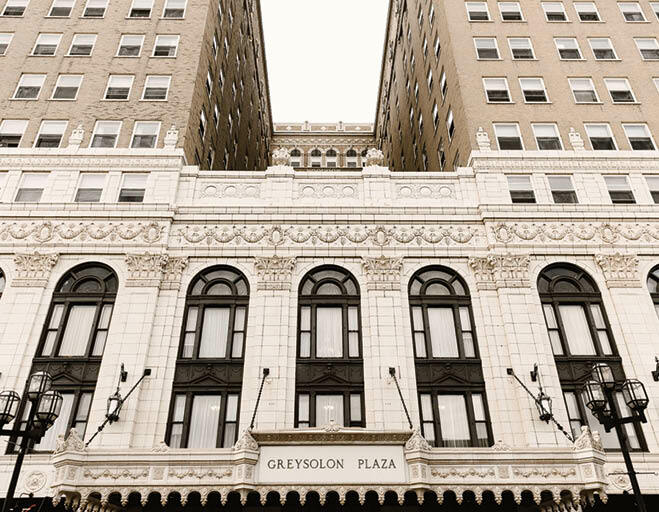 Greysolon Ballroom in Duluth, along with its second space the Moorish Room, is all about vintage opulence, complete with sparkling chandeliers and ornate painted woodwork and ceilings. Large weddings are welcome here, with room for up to 325 guests. Though modeled after vintage Scandinavian fishing villages, these luxurious lakeside townhomes and suites will suit modern brides perfectly. Literally walk out the door of your townhome and down the aisle to your groom on the shoreline. Great for smaller guest lists, Larsmont also is noted for its upscale and unique menus. NorShore Theatre is a new venue for couples who want a historic feel to their day, no matter how big or small the guest list. The restored Art Deco theater began as Duluth’s Grand Opera House in the late 19th century and features a brilliant marquee entrance. The sweeping vistas of the lake, often with boats passing in the ceremony’s background, make weddings at Pier B unmistakably North Shore. Though minutes from Canal Park, the ambiance is that of an all-inclusive resort, with fine dining, activities and—of course—the views. The scenic gondola ride to the Summit Chalet is only the beginning. Once you arrive, you’ll enjoy outdoor ceremony space with 100-mile views overlooking the lake. Superior National Forest provides lush landscape during summer months, but fall colors exhibit its true majesty. Cap off the night with a romantic mountain gondola ride under the stars. Location, location, location. Superior Shores Resort in Two Harbors takes advantage of its stellar setting on, you guessed it, the shores of “the big lake.” Say your vows on their lakefront ceremony site, then move the party into the newly renovated ballroom, which offers direct access to the lake-level patio.